Wounded Army Ranger SFC Cory Remsburg came home to Gilbert, AZ last week to a well-deserved hero’s welcome after years of rehabilitation for injuries sustained in Afghanistan. Cory Remsburg is a hero and an inspiration and Ranger Lead The Way Fund has been honored to have been able to help support Cory and his family throughout his recovery efforts. We are so proud of you Cory and thrilled for you and your family that you are home for good! GILBERT, AZ – A wounded Gilbert man received a hero’s welcome home Saturday. U.S. Army Ranger, 30-year-old Cory Remsburg, came home for good after years of rehabilitation for his injuries. Cory’s family is happy to have him home, and they say they’re really thankful he’s even alive. His friends, family and fellow veterans gave Cory a warm welcome as he returned. A crowd was there as his family’s car turned into the flag-lined driveway. 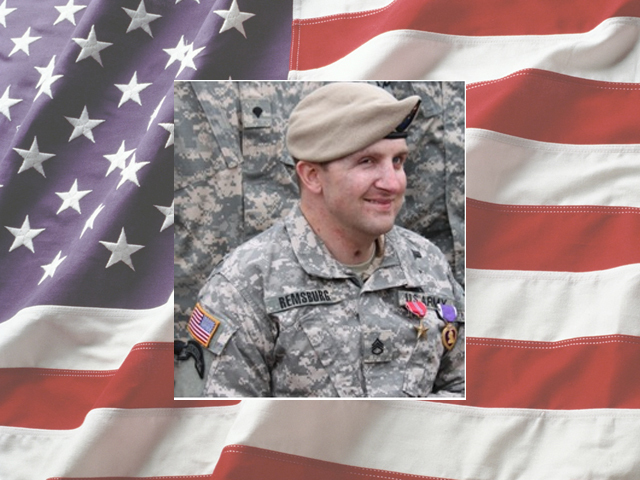 Cory suffered severe brain trauma in an explosion in Afghanistan about four years ago. He lost one of his fellow Rangers in that IED attack. Now he’s walking and talking again, and happy to be home. “He’s working hard to try to find that independence. And that’s what we’re here to do. Help him find that,” said Cory’s dad, Craig Remsburg. He’s become an inspiration to his family and all of the people who came out to thank him for his service. They sang songs, prayed and greeted Cory one by one. Cory’s parents say he led a very active lifestyle before the attack — he enjoyed running and skydiving when he was home. He was on his 10th combat rotation when he got hurt. Cory’s parents say they’re sure he’ll find ways to stay active. They think he might even start cycling, since one of his “welcome home” gifts was a new bike. They know Cory has a long road ahead of him, but they say they’re with him every step of the way. “He’s dealing with it head on. And you’ve got to be a proud parent, knowing that your kid is down and out, but he’s not letting that stop him,” Craig said.